One of my most favorite things to do is to host dinners and parties for my family and friends. Today, I would like to share some great tips for hosting the perfect cocktail party. A cocktail party is the perfect event for hosting close family and friends. Everyone can gather around, enjoy delicious snacks and drinks in a relaxed setting, and just have a great time! First, designate a special area for a beverage station. If you do not want to serve alcoholic drinks at your party, you can serve punch, lemonade, assorted soft drinks, or tea. If you do serve alcoholic drinks at your cocktail party, always have beverages for those who do not drink liquor. I chose to use my French Pastry Table as a beverage station. You will want to stock your station with glasses, drinks, ice, and other accoutrements for the perfect beverage. Remember to place cocktail napkins, a bottle opener, and cork screw on your beverage area. I did not have an ice bucket so I chose to use a pretty bowl with tongs for the ice. After assembling an area for beverages, you will want to plan your menu and set up a table, buffet, or other serving surface for your snacks. I like to serve finger foods that can easily be made ahead of time so I can enjoy visiting with my guests. The menu for this party was very simple. It consisted of Mr. Bleu’s famous jalapeno poppers and his Grandmother’s delicious pizza hors d’oeuvres. In addition to these tasty treats, I also served assorted fruits, veggies and dip, relish tray with pickles and olives, assorted meats, cheeses and crackers, and for something sweet chocolate bark. I’m a planner so the day before I gather all of my serving dishes and place them on the table. I also label each serving piece with the food that will go on it. It just makes it so much easier the actual day of the party. I apply this principle whenever I’m having a special dinner, party, or event. Remember to add fresh flowers to your table. You can pick these up at your local market for a very inexpensive cost. Above all, make sure you have fun and enjoy visiting with your guest. There is nothing worse than a stuffy and uptight party. You want to make memories and most of all you want your guests to feel special and have a wonderful time! This chocolate bark is so easy to make, and it makes a great party favor placed in cellophane bags and tied with a pretty ribbon. You just melt a pound of good quality chocolate, spread it out on a cookie sheet lined with wax paper, and add toppings such as dried fruits, nuts, and crushed pretzels. I made both white chocolate bark and milk chocolate bark. Mr. Bleu doesn’t like white chocolate, and I think the white chocolate looks pretty with dried apricots and cranberries. Allow the chocolate to harden. After it hardens, just break it up into small pieces. It doesn’t have to be fancy. I like the earthy, natural look of the uneven pieces. 1 package of thinly sliced smoked bacon. Jalapenos halved and seeded. If you will soak them in salt water, it will help to remove some of the heat. Directions:Take a bite size piece of boneless chicken and place it upon a half of jalapeno with a tablespoon of cream cheese stuffed into the pepper. Wrap a half a piece of bacon around the chicken and pepper and secure with a toothpick. Grill at 350 to 400 degrees for 30 minutes turning the poppers often. Mr. Bleu assembling the poppers. Grandma Margie’s Pizza Hors d’oeuvres were always a big hit at family gatherings. Mr. Bleu loves these. Many years ago, when we were newlyweds his grandmother wrote this recipe out for me. I so treasure recipes that were written out by loved ones that are no longer with us. Directions: Add all the ingredients to the cooked sausage. Heat over low heat until cheese melts. Then put 1 TBSP on each slice of bread. Put on a lined cookie sheet and brown in a 375 degree oven until melted and bread is toasted. *I toasted mine for about 15 minutes, but watch it closely. Baking times vary according to your oven. Hopefully, I have inspired you to gather your family and friends together and host a great party. After all, that is how wonderful memories are made. Thank you so much for stopping by! I hope you have a very Happy Wednesday, and I will see you tomorrow for Tablescape Thursday! Shannon, this was a great post; and everything looks amazing! I am sure that any party at your beautiful home is a hit! Hi Shenita! You are so sweet to leave such a kind comment. 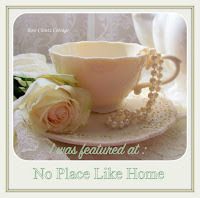 I love your blog, and you have a gorgeous home! I hope that you have a great rest of your week!!! Looks like a wonderful cocktail party! !…and who would not love making a drink at the gorgeous table with the history of Charles Faudree!….the appetizers looked so delicious!! !..I am sure you two are such gracious hosts in your beautiful home! Thank you so much Shirley! You are too kind! I’ve enjoyed looking at your beautiful pictures of the home tours you took last weekend. Both homes are absolutely beautiful! It looks like you had a great time! I hope that you have a Happy Wednesday! Another great blog entry! Good to see Mr. Bleu too! What a wonderful host and hostess you two must be! Hi Mrs. Lane! Thank you for your sweet comments. I’ll be sure and tell Mr. Bleu what you said. I hope that you have a wonderful Wednesday!!! Hi Summer! Thank you for the very kind comments. I’m so happy that you stopped by, and I hope that you are having a wonderful day!!! What an amazing cocktail party and I love seeing your bar cart all set up and ready. Now I cannot wait to try the Jalapeño Poppers – they look delicious! Happy Wednesday, Shannon! Thank you so much for your very sweet comment! You will love the Jalapeno Poppers! Every time we serve them people go crazy! I’m so happy that you stopped by, and I hope that you are having a wonderful day!!! Thank you so much Janice! I’m so happy that you stopped by, and I hope that you have a wonderful evening!!! Mr. B does make fantastic poppers. Grandma Margie’s pizza things are pretty tasty too. Hi Sonya! I will be sure and tell Mr. B what you said! We miss you guys! I hope that you have a wonderful evening!!! Wow, what great inspiration for a party! It looks like you have some good help, too 🙂 Those first two photos are absolutely stunning and really caught my eye! Hi Julie! Thank you so much for the very sweet compliment! I don’t know if you know the back story on the table the beverage station is on, but it was a gift from Mr. Bleu and belonged to the late Mr. Charles Faudree. I wrote a previous blog post on it. I still can’t believe that it is mine! I’m so happy that you stopped by, and I hope that you have a blessed day and a wonderful weekend!!! Thank you Rebeca! They are really good! I hope that you are having a great day, and I hope that you have a wonderful weekend!!! I like all your tips and Mr. Bleu’s poppers sound fantastic! Thank you Michelle! I’m so happy that you stopped by, and I hope that you have a wonderful evening!!! Hi Lorri! That is neat that you and I have a couple of the same serving pieces. Most of mine belonged to my great grandmothers. I’m so happy that you stopped by, and thank you for leaving such a kind comment. I hope that you are having a wonderful Sunday!!! Hi Shannon: It was wonderful to see that you use a lot of Temp-tations china like I do! I see you like the floral lace pattern; I have that too…in blue. I just signed up for your blog….loved all your posts! Hi Judy! It is so nice that you collect Temp-tations too! I have a lot of pieces. I started out with the Old World Blue, but have really started loving the floral lace pattern. It reminds me of something from long ago. As you can see, I am dish crazy!!! I’m so happy and flattered that you signed up for my blog! Thanks so much for stopping by and leaving such a sweet comment. I hope that you have a very Happy Monday and a wonderful week!!! Linda, thank you so much for your very sweet comments! I’m so happy that you stopped by, and I hope that you have a very wonderful and happy holiday weekend!!! I love your set-up and thanks for sharing your links with us at Celebrate Your Story. Have a wonderful holiday! Thank you so much Sandra for allowing me to be a part of the party! I hope that you are having a wonderful holiday weekend!! !